Linda Shenton Matchett: Talkshow Thursday: Lights out! 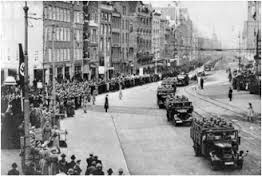 While searching for WWII events to blog about, I stumbled onto an unfamiliar factoid: On October 9, 1944 Germans forces occupying the Netherlands turned off the electricity in Amsterdam. Why did the Germans do this? Despite the questions that filled my mind, I found little additional information. 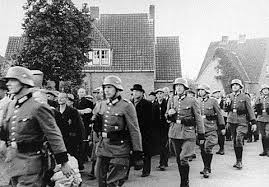 Had the Dutch been caught performing some act of resistance that angered their occupiers, or was it simply another mechanism to bring more suffering to a country the Germans sought to dominate? The Nazis had already cut off food and fuel shipments from rural areas. Reports indicate the winter of 1944-45 came early and was exceptionally harsh. The canals froze over, preventing barges from getting through. A famine set in. Soup kitchens were set up, and Operation Manna and Chowhound alleviated some of the shortages, but thousands died of hunger. As I write this, I’m sitting in a darkened room in our small, rented cabin by the Pemigewasett River. It’s early, and the sun hasn’t risen, but the glow of my computer screen illuminates my workspace. Two digital readouts and several LEDs gleam in the darkness from various pieces of electronic equipment. It’s a cold morning-well below freezing, but I am toasty-warm thanks to the propane stove (that probably has an electric ignitor). I’m in the woods, but still have heat, electricity and internet service. I don’t know about you, but I take electricity for granted until there is an outage. Even then I am rarely inconvenienced because we have a large gas-powered generator and two small battery generators. What about you? Have you ever experienced a long-term loss of power? What was it like?